As automotive manufacturers look to improve fuel economy and battery range for electrification, material lightweighting without compromising mechanical integrity is vital. Metals, although lightweight, can come with indirect processing and manufacturing costs and may become even more expensive with the uncertainty surrounding global metal supply. Sheet molded composites (SMCs) are a viable alternative to metals in certain applications, while still achieving the desired physical properties. 3M recently introduced Glass Bubbles S32HS to help OEMs achieve up to a 40 percent weight reduction of composite parts, at a density below 1.0 g/cc, while still enabling a class A paintable finish. This innovation makes SMCs an attractive option in automotive design for OEMs. These hollow glass microspheres (made from water-resistant and chemically stable soda-lime borosilicate glass) can be used as a low-density filler material for many applications. 3M glass bubbles help to reduce weight; reduce noise, vibration, and harmonics; reduce thermal expansion; and contribute to cost savings. They are used in a variety of applications in diverse markets, including automotive, construction materials, electronics, marine, and paints and coatings. "With the trend toward electric and high-efficiency cars, reducing overall vehicle weight is key to staying competitive," says Ray Eby, vice president of 3M Automotive Electrification. "A typical automobile has about 660 pounds of composite parts. 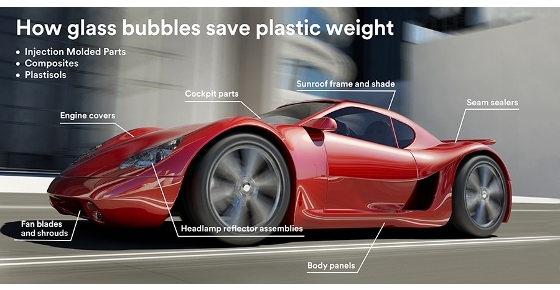 With ultra-lightweight SMCs enabled by our glass bubbles, OEMs can significantly improve a vehicle's energy usage, while saving money -- one less bump in the road in the race to automotive electrification." For many years, 3M has partnered with the automotive industry to enable weight reductions for major automotive manufacturers. By replacing conventional fillers, these hollow glass microspheres can reduce the weight of molded parts without sacrificing strength or aesthetics. For the first time, 3M has been able to break the density barrier, making ultra-lightweight SMCs more competitive to steel and aluminum, opening up new possibilities for the material mix in automotive applications. "Our customers continue to challenge us to lower the density and weight of fiberglass reinforced material systems to support their automotive lightweighting efforts," says Terrence O'Donovan, vice president, marketing and sales for Core Molding Technologies. "A density of 1.0 g/cc or below has long been a goal, while still enabling a Class A finish. Using 3M Glass Bubbles helps enable us to meet our customers' expectations." 3M glass bubbles are an established lightweighting technology used in enabling lightweight sealants, injection molded parts, and SMCs. The launch of Glass Bubbles S32HS is the latest example of the company staying on the forefront of this multi-beneficial technology. Learn more about lightweighting SMCs at 3M.com/SMC. Lots of great information here! Learn more about 3M Automotive Lightweighting Solutions at 3M.com/AutoLightweighting.